Owen Clarke Design are specialists in the design of steering systems, their components and the engineering design of rudders with both composite and metal stocks. Complex multiple rudder steering systems for open class and multihulls are a specialty where solutions can be evolved using custom and/or proprietary bearings and components. 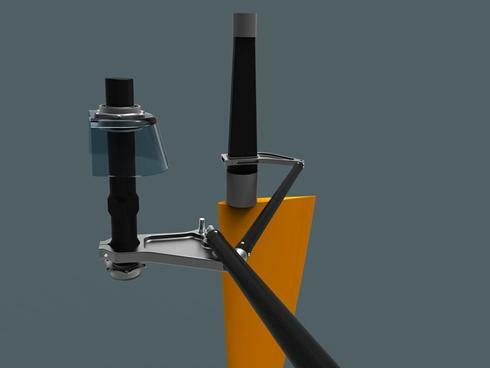 The Solidworks computer generated model below illustrates part of the steering system below decks on our latest racing yacht, Acciona. Rudders and other appendages are designed using 3D software with appropriate foil sections taken from our extensive library of shapes. Engineering is undertaken in-house for composite or metal stocks to whichever relevant standard, ABS, ISO or in conjunction with a certification society. Output to the Boatbuilder or specialist manufacturer is typically in the form of an IGES solid model for the blade and when required a female mould of the stock. OCD do not limit ourselves to work on superyachts and grand prix race boats. Above is an example of more mainstream work, a carbon fibre transom hung rudder for a Van Gorkom designed 9.5m race boat.